Thanksgiving week is upon us, and today I weighed in and lost another pound. This brings my weight loss to 12 lbs since August. I currently weigh 181 lbs and dropping. I’m so happy to be able to get healthy again despite life’s ups and downs. Working out and eating clean is really making me feel on top of the world again. I am 22 lbs away from what I was over a year ago. I’m loving the journey as well as the destination. One workout and meal at a time. Planning charities always keeps my spirit grounded. 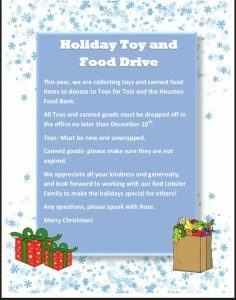 My co-workers and I are doing a Toy Drive for Toys for Tots and a food drive for the Houston Food Bank. I’m humbled and grateful to my “work family.” I find during times of stress giving back offers a little calm in the chaos. It puts everything into perspective to lend a helping hand to those in need. I’m working on my mind, body, and soul. There is always room for improvement. This entry was posted in Uncategorized on November 19, 2018 by mychangeforaten.